2. Traveling at light speed, would we be able to travel outside the Milky Way with either manned or unmanned spacecraft? So now, by some means we’ve accelerated up to our speed of light, and we want to travel outside the Milky Way. The short answer is no, we wouldn’t be able to travel outside the Milky Way, but let’s look at this in stages. First we have to leave the Solar System. We characterize the size of the Solar System by where the Sun’s gravity no longer dominates. This is about 1-2 light years away from the Sun; let’s say 1 light year. So, 1 full year at light speed to leave the Solar System. That’s a start. Now the Milky Way itself has a decent bit of structure, where the disk of the Milky Way (i.e. where most of the stars, gas, and dust are) has a thin component (~ 500 parsecs or 1,631 light years), and a thick component (~ 1,000 parsecs or 3,262 light years). 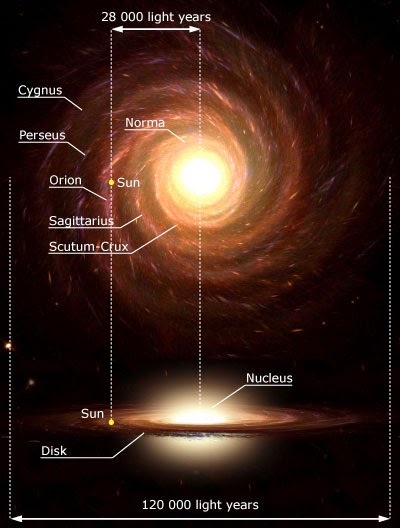 The Milky Way is more than just the disk though, with a large, roughly-spherical distribution of older stars (and dark matter) around it known as the galactic halo. The size of this halo isn’t…well-defined. It’s got a lot of clusters of stars though, so we can define its “edge” by where the overwhelming majority (90%) of these clusters are contained. This is about 100,000 light years away from the Sun. So, at the speed of light it’d take us about 1 year to escape the Sun, ~1,600 years to leave the thin disk, ~3,300 years to leave the thick disk, and 100,000 light years to reach the edge of the Milky Way. No human would survive any one of these trips (save for the trip out of the Solar System), not even Methusaleh. Let’s get a little bit more practical, since as far as we know it’s impossible for anything with mass to reach light speed. The effects of relativity start to become significant at about 40% light speed (specifically meaning that the kinetic energy of something moving at 40% light speed is 9% higher than it would be without relativity). So, moving constantly at 40% light speed from Earth, it’d take about 250,000 years for a spacecraft to reach the edge of the Milky Way. These are big numbers, so let’s give a reference that might be more understandable. Anatomically-modern humans (homo sapiens sapiens) evolved in Africa roughly 200,000 years ago. That means that it’d take more time to leave the Milky Way at a “reasonable” speed than humans have even existed. And we’re not even talking about the building of a spacecraft that could support a viable offshoot of the human race! Let’s modify this even more. Now, you know and I know that you don’t just start moving at high speeds from rest. You have to accelerate up to it. We’ve already established that we could probably withstand an acceleration of 3g indefinitely. Thus, with infinite energy at our disposal we accelerate from rest up to 40% light speed, and then maintain that speed…basically forever. It’d take about 47 days of heavy discomfort to get up to 40% light speed, over which you’d travel about 1600 times the distance between the Earth and the Sun. After that point it turns out that the timescales are still more or less the same as before, since the distance covered at this point is nothing compared to the distance that would still need to be covered. Long story short? Even at light speed, hell even at many times light speed, no one person would ever survive the trip out of the galaxy. You’d have to have a fully self-sustaining society and system of resources for that society to live just to get a picture of the disk. Long story even shorter? The Milky Way galaxy is really freaking big.